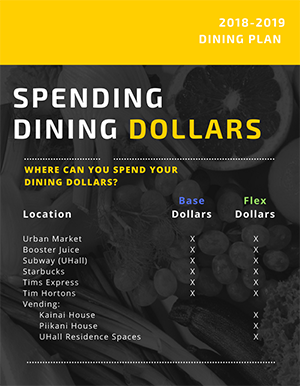 First year students living in University Hall, Kainai House or Piikani House are automatically enrolled in a minimum Commuter Residence Dining Plan, with no option to "opt out." This is a "room and board" program. Food services are provided in an à-la-carte style with a variety of locations on campus, offering a wide array of healthy food choices as well as popular choices throughout the day and evening. Check out Dine on Campus with Chartwells for more information. We operate six outlets on campus: the Urban Market, Booster Juice, Subway (UHall), Starbucks, Tim Hortons, and University Hall Tim Hortons Express. The Residence Dining Plan allows you to select your preferred venues. We offer all students and staff the convenience of a declining balance on your U of L Student ID Card for all purchases. This card eliminates the need to carry cash. By using the U of L ID card—in the form of the campus dining plan — you can avoid the withdrawal fees you may incur with a bank card. The Students' Union Food Court is located on the second level of the Students' Union Building, and provides students with 6 food kiosks. These independant food kiosks do not accept the Residence Dining Plan.